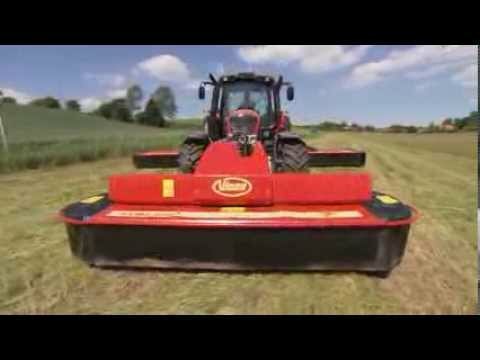 Front mounted plain disc mowers with low weight and very responsive headstock design. Outstanding ground following ability, easy operation and low weight are among the highlights of this machine. The Vicon EXTRA 328F and 332F are characterized by excellent cutting performance and ground following ability in all terrain. The design does not require a flexible front linkage, as the movement is build into the machine. Fully welded EXTRA cutterbar with triangular discs. The EXTRA cutterbar is designed for low maintenance and offers a very quiet operation. Fully welded cutterbar for a very strong construction. Even number of contrarotating discs for improved overlap. Three bladed discs for more cuts. Smooth stone guard design for excellent cutting quality. High oil capacity ensuring low working temperature. Low noise level thanks to specially tooled gear wheels. Twisted knives for a clean cut in all conditions. The new EXTRA 332F is characterized by excellent cutting performance and ground following ability in all terrain. The design does not require a flexible front linkage, as the movement is build into the machine. To ensure best possible pattern of movement, the mowing unit moves independently from the front linkage. Standard PTO speed is 1000 rpm. However by simply switching driveline pulleys, 750 rpm for reduced fuel consumption can be achieved. This makes it possible to maintain the correct PTO speed, but using reduced engine revs, creating an opportunity for lower fuel consumption – an innovative solution to the problem of front PTO systems not offering an Economy speed.